Laundry detergent packets are getting into the hands -- and mouths -- of an increasing number of small children, resulting in serious and even fatal consequences, according to a new report. 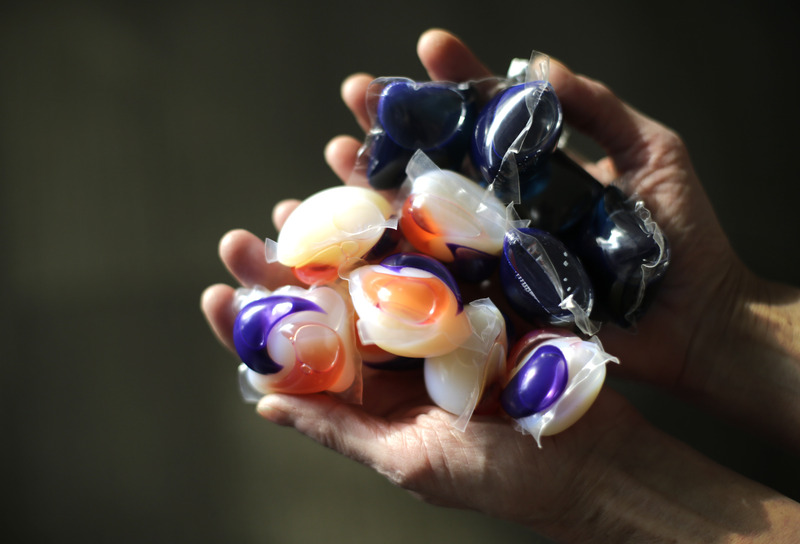 The study, published Monday in Pediatrics, showed a 17 percent rise in calls to U.S. poison control centers reporting accidental exposures to laundry detergent packets involving young kids in 2013 and 2014. "We found that the majority of poisonings were due to exposure to laundry detergent packets and unfortunately it was precisely those products that were causing the greatest toxicity," lead study author Dr. Gary Smith, director of the Center for Injury Research and Policy at Nationwide Children's Hospital in Columbus, Ohio, told CBS News. Smith and his team analyzed data from more than 62,000 calls made to U.S. poison control centers after unintentional exposures to laundry or dishwasher detergent in children under the age of 6. While the number of exposures increased for all forms of detergents, the greatest jump was seen in laundry detergent packets followed by dishwasher detergent packets, which saw a 14 percent rise. The researchers found that liquid laundry detergent packets -- as opposed to granules -- were the most harmful when ingested by children. These exposures resulted in 17 comas, six cases of respiratory arrest, four cases of pulmonary edema, and two cases of cardiac arrest. Two deaths occurred as a direct result of ingestion of laundry detergent packets. The authors say the detergent packets are more concentrated than traditional detergent, making them more toxic. Kids under the age of 3 accounted for the majority of cases in the study, with 2-year-olds making up slightly more than 16 percent of dishwasher detergent exposures and about 30 percent of laundry detergent exposures. "Children at this age will explore their environment by putting things in their mouth and if they simply bite down on one of these things, they'll burst and those contents will shoot to the back of their throat," Smith said. Smith said that the study findings provide enough basis to recommend parents opt for traditional laundry detergent over the packets. "There is no reason why children should be rushed to hospitals in a coma and with swelling down their lungs and we have to intubate them," he said. "There's no reason why children should die when we have effective, safer alternatives for detergents." If parents or adults with young children visiting their home do have these products, he urges that they be treated like any other poison. "They should be kept up away and out of sight of children and preferably in a locked cabinet," Smith said, "because really the time it takes you to pick up a pair of dirty socks and throw them into the laundry is all it's going to take for a child to put one of these in their mouth, bite down, and have it squirt down their throat." While ingestion causes the most harm, contact with the eyes or lips can also lead to irritation and pain. Depending on the route of exposure, initial symptoms can include drooling, swelling, choking, coughing, and difficulty breathing. Parents who suspect their child has come into contact with the liquid inside these packets should seek medical advice immediately. "If parents have any question that their child has been exposed to the contents of a laundry detergent packet, they should call their poison help line to ask if they should be seen and follow their advice," he said.